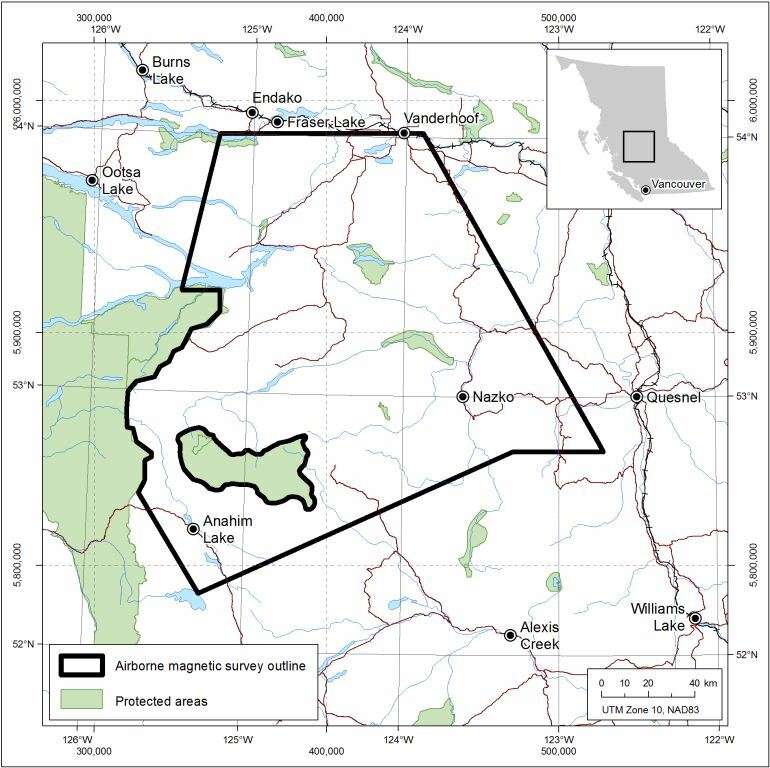 Geoscience BC is pleased to issue this Request for Proposals (RFP) for an airborne magnetic survey, to be flown as part of the TREK (Targeting Resources for Exploration and Knowledge) Project. The TREK Project will focus on BC's northern interior plateau region, an area which is highly prospective for mineral resources, yet is underexplored due to complicated and poorly understood bedrock geology and overburden. Geoscience BC's TREK Project will include new airborne geophysics, new stream, lake, soil and till geochemical sampling, and new geological mapping and mineral deposit studies. The project will cover an area of over 20,000 km2, extending south from Vanderhoof and Fraser Lake, and west from Quesnel. Project partners in TREK include the BC Geological Survey (Ministry of Energy, Mines and Natural Gas), the Mineral Deposit Research Unit at the University of British Columbia, PK Geophysics and Noble Exploration Services Ltd.
Geoscience BC is now seeking a proponent to undertake an airborne magnetic geophysical survey over the TREK project area (the outlines of which may vary depending on the acquisition of other airborne data). Proposals should be submitted by email no later than 12 pm (Pacific) on Thursday May 30, 2013. All questions and communication should be directed to Andrea Clifford, Project Coordinator and Communications Manager, Geoscience BC. Q. Can you please specify the format of the drape surface which would be suitable for our proposal? Is it a mandatory requirement that the successful proponent uses a pre-calculated drape surface to fly the survey? A. Geoscience BC will accept a proposal without a pre-calculated drape survey being submitted. The calculation of a drape surface provides Geoscience BC with an understanding of the flight height that is likely to be achieved after consideration of the safe operation of the aircraft within the survey area. However, how the data provider intends to compensate for magnetic herringbone effects caused by aircraft performance being different going uphill and downhill needs to be addressed, and a detailed description provided describing how the magnetic data will be processed to remove these effects from the final leveled data supplied. Also, if a pre-calculated drape surface is not provided, then additional QC provisions may be required in the survey contract to ensure that the drape surface is regular and smooth from line to line, and that varying flight altitudes from line to line are not degrading the quality of the interpolated magnetic data and compromising future quantitative analysis of the data. The design flight height of the survey is related to the line spacing of the data - it is not intended that the aeromagnetic data be collected as close to the ground as possible.